1. Open Internet Services Manager from your Administrative Tools. 2. Open the Properties for the Website that is hosting OWA. This is normally the default website. 3. Select the Directory Security tab, then click Server Certificates. 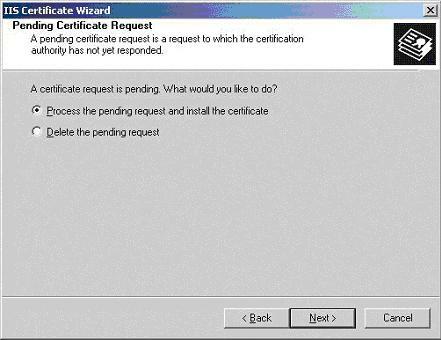 The Pending Certificate Request panel appears. 4. Select Process the pending request and install the certificate, then click Next. The Process a Pending Request panel appears. 5. Navigate to the site certificate that you received, then click Next. The Certificate Summary panel appears. Repeat to install the intermediate certificate. You have now installed the SSL certificate onto your website. 2. Select the Directory Security tab and the click the Edit button in the Secure Communication section. 3. In the Secure Communications panel, check Require Secure Channel (SSL) option . Note: You could also check the box Require 128-bit encryption. If you do check the 128-bit box, any browsers that do not support 128-bit encryption will be unable to connect to OWA. When users enter http://ahost.adomain.com/exchange, they will receive an HTTP 403.4 - Forbidden: SSL required Internet Information Services error message because OWA is configured to require SSL. SSL uses the HTTPS protocol, which means users would need to enter the url as https://ahost.adomain.com/exchange. Click here for the Microsoft article regarding forcing the use of SSL with OWA. Note: One final step that you may need to take is to ensure that your Firewall is configured to allow HTTPS—port 443 by default—to pass through. You have enabled SSL for OWA. If you have any problems with the installation of your certificate on IIS 4x, check that you have installed the root and intermediate certificates correctly.